William Golding's compelling story about a group of very ordinary small boys marooned on a coral island has become a modern classic. At first, it seems as though it's all going to be great fun; but the fun before long becomes furious & life on the island turns into a nightmare of panic & death. As ordinary standards of behavior collapse, the whole world the boys know collapses with them—the world of cricket & homework & adventure stories—& another world is revealed beneath, primitive & terrible. 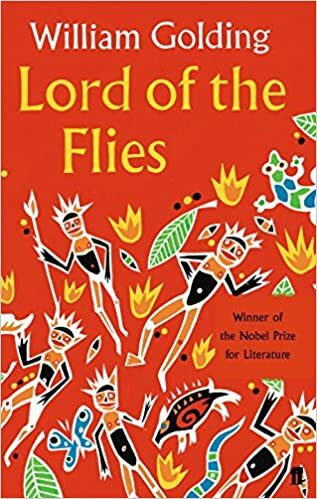 Labeled a parable, an allegory, a myth, a morality tale, a parody, a political treatise, even a vision of the apocalypse, Lord of the Flies has established itself as a classic. When a group of primary school boys are stranded on an island they must do whatever they can to survive. Even if that means fighting like savages and causing chaos. This was a good read. I liked the narrative voice being the child because we really got to see the young boys perspective. Although I really enjoyed the storyline, I felt that there were some scenes, especially those involving violence, were a little unrealistic. However, when in that situation. I recognise that people often do the unexpected. This is something that was really well conveyed throughout as I was always left wondering what was going to happen next. The ending was also a bit disappointing. I liked how it was left ambiguously and you have to assume what happens however I felt like there could have been more detail and description. My favourite character was Piggy. As soon as he was introduced I found him to be quite sensible and cute. I loved watching his friendship with Ralph develop as the novel progressed because at the beginning it was clear Ralph was unsure about him. I was so sad and shocked to hear what happened to him but I felt like he was a fabulous character. Lastly, I enjoyed the themes introduced. For instance, group hierarchy was something really interesting to read about as this showed how the characters reacted to each other and which boys were seen as better leaders. The underlying message here is that human nature is corrupt and beyond redemption and that's something so fascinating to be able to explore. I also loved the reference to the title half way through as this made a lot of sense despite the pretty twisted and gruesome imagery. Overall this was a short and pleasurable read, despite having a few faults. I felt that it was well written and I enjoyed the character development throughout. There are some violent and gothic scenes so I would recommend this to older readers!